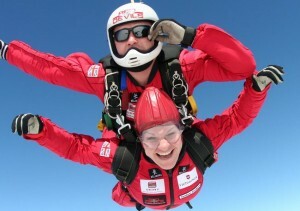 To celebrate the 75th Anniversary of the Battle of Normandy and the Battle of Arnhem, we are offering you the chance to skydive with the World famous Red Devils Army Parachute Display Team. The Team, made up of serving members of The Parachute Regiment, are the Army’s official parachute display teams and can be seen at various events across the country throughout the year. Every member of the team has served a minimum of three years in a Parachute Regiment Battalion and has taken part in at least one operational tour of duty in either: Kosovo, Sierra Leone, Iraq and/or Afghanistan. This year, we are inviting you to join us on 29 August 2019 in Salisbury for an experience like no other. The jump itself will cost £300, but we are offering supporters the chance to pay just £100 towards the jump and we will cover the rest. All we ask in return is that you raise a minimum of £500 sponsorship* for the charity. *sponsorship target must be reached at least one month before you are due to jump, otherwise you may be required to pay your own jump fee. Merry Christmas to all our supporters and a Happy New Year. SUPPORT OUR PARAS is a charity which supports The Parachute Regiment through the welfare of serving soldiers and families and those affected by recent operations, and through the maintenance of its regimental efficiency, ethos, spirit and heritage.